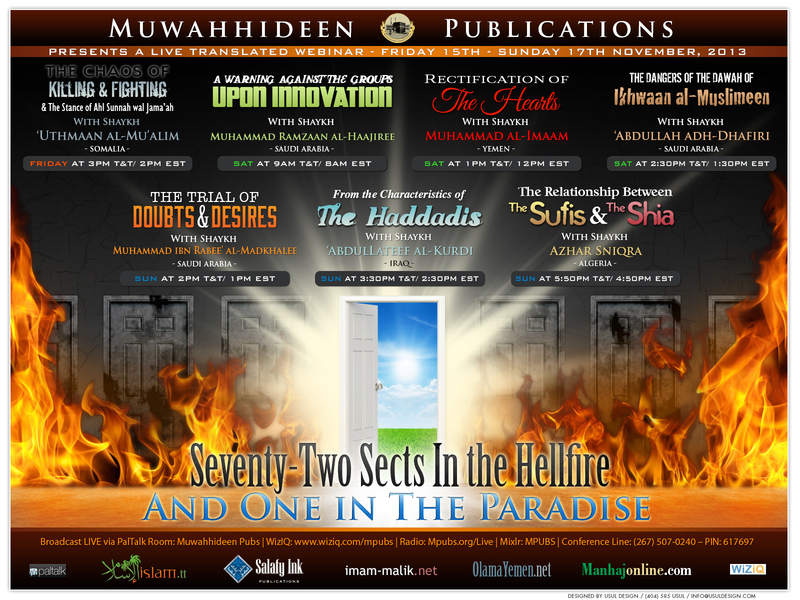 Muwahhideen Publications in conjunction with Islam.tt, Salafy Ink, Imam-Malik.net, Olamayemen.net and Manhajonline.com are pleased to announce a Weekend Webinar with The People of Knowledge from Friday 15th to Sunday 17th November 2013. This event will be broadcast LIVE in Masjid Ibn 'Abbaas, Tobago, two masaajid in Trinidad, Masjid ul Khaleefah and Masjid us Sunnah, and six Masaajid in the U.S. Masjid Al-Bukhaari, Florida, Masjid Ibn 'Abbas, Georgia, Masjid Nur Allaah, New York, Masjid as-Sahabah, Ohio and Masjid Tawheed, Michigan. The lectures will be translated LIVE into English in shaa Allah.